Viet Nam has so far protected 69 products with geographical indications (GI) and six foreign ones. Over the past 10 years, the number of protected GIs has increased by 3.5 times. 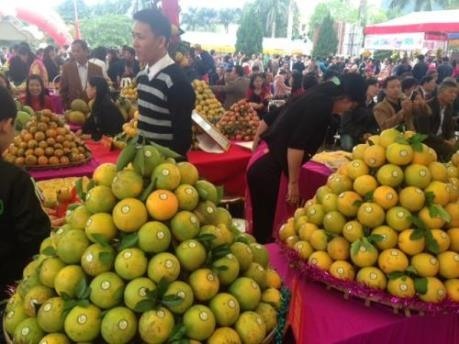 The price of Cao Phong orange, a fruit of the northern province of Hoa Binh, has almost doubled after it was registered for GI protection several years ago. The figures were released by Director of the Ministry of Science and Technology’s National Office of Intellectual Property (NOIP) Dinh Huu Phi at a seminar entitled ‘Information and communication on intellectual property’, held in Ha Noi on Tuesday. Phi said there were 34 provinces and cities with protected GIs. Some 47 per cent of the products are fruits, 23 per cent are cash crops and forestry products, 12 per cent are seafood, 8 per cent are rice and the rest are other products. There are also five non-food items including Hue conical hat, Tien Lang pipe tobacco, Vinh Bao pipe tobacco, Nga Son papirus and Yen Tu yellow apricot. Most of Viet Nam’s protected products are fresh products and raw materials such as coffee beans, cinnamon and star anise. “The process of GI protection for agricultural and handicraft products has positive impact on people’s awareness, attention and investment in local resources, reputation and value of protected products,” Phi said. After receiving GI protection, the prices of such products tend to increase by 20-100 per cent. In particular, Cao Phong orange price is nearly doubled; Meo Vac mint honey rose 75-80 per cent; Phu Quoc fish sauce by 30-50 per cent; Dai Hoang bananas by 100-130 per cent; Phuc Trach pomelo up 10-15 per cent; and Vinh orange by more than 50 per cent. According to the NOIP, Viet Nam has successfully registered four GIs abroad, including three in Thailand and one in the EU. The EU has agreed to protect 39 Vietnamese GIs.